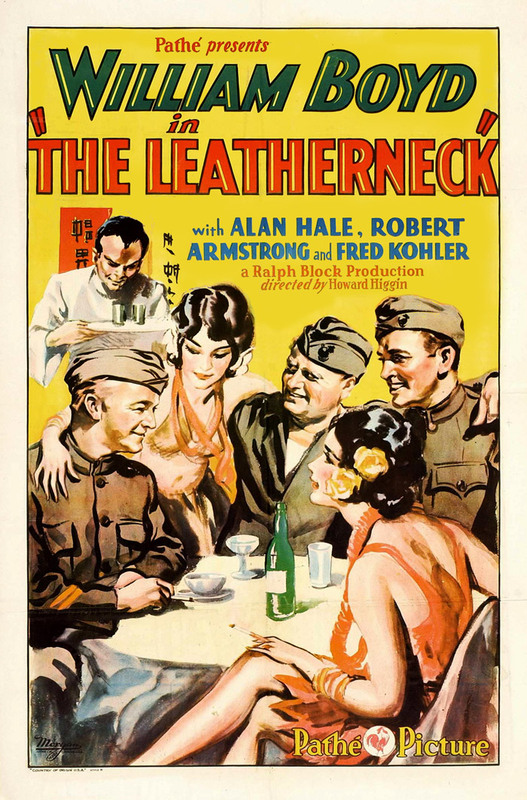 1929’s The Leatherneck must have been perfect matinee fare for depression era boys looking to escape for an hour or so into the far-flung adventures of the United States Marine Corps. The film is brief, straightforward, and uncomplicated— with a healthy dose of buddy humor, fisticuffs, and male bonding. It was clearly intended for the raucous appetites of young men with a developing sense of bravado, and hints at the military camaraderie of later films such as Gunga Din and The Lost Patrol. Through a series of flashbacks, The Leatherneck tells the story of the court martial of a wrongly accused Marine. It stars William “Bill” Boyd as Tex (as Hopalong Cassidy, Boyd would go on to be a screen icon of the thirties and forties), who in the days immediately following the armistice has been saddled with the unenviable task of guard duty. He strikes up a fast friendship with one of the stockaded Germans, Otto “Fuzzy” Schmidt (Alan Hale), with whom he shares a love of beer and brawling. Moments after the film’s beginning the duo becomes a trio as Private Hanlon (Robert Armstrong, Carl Denham from King Kong) joins their ranks. Owing to these newfound friendships, Fuzzy decides to become an American citizen — as well as a Marine — and is soon reunited with his pals when their unit is transferred to politically tumultuous Russia. There Tex falls in love with and quickly marries Tanya (Diane Ellis), a local girl whose aristocratic father owns a Manchurian potassium mine. However “Captain” Heckla, an American opportunist (war profiteer, if you like), steals the mine by arranging for Tanya’s father and brother to be murdered by the Bolsheviks. Heckla then kidnaps Tanya and absconds with her to the mine, leaving the marines to think Tanya shared the same fate as her family. But when Fuzzy and Hanlon learn that Heckla is running the potassium mine, they suspect that Tanya is still alive and abandon their posts in order to investigate. Tex follows, and when he arrives at the mine he discovers that Hanlon has been shot, Fuzzy has been tortured, and Tanya is nowhere to be found. They attempt to return to their unit, but Hanlon dies en route, and Fuzzy is barely functional after days and days of torture. Tex is charged not only with desertion, but also with Hanlon’s murder, and is placed on trial for his life. While Tex’s life hangs in the balance, the audience asks: Where is Tanya? The Leatherneck’s best scene, in which Tanya’s father and brother are executed, is out of character with the rest of the film: it was likely inserted to give wide-eyed audiences a sense of the violence of the Soviet revolution, and is striking in its expressionism: rather than seeing the men themselves riddled with bullets, the camera goes shot-reverse shot between the victims and the sneering machine gun crew as it pans across a wall of shadows, starkly rendering each shadow as it spasms and crumbles to the ground. This is quite a rare film, even considering its Academy Award nomination in the Writing category. While it doesn’t rise to the same level as another of Bill Boyd’s military silents, Two Arabian Knights, it’s still worth seeking out. Before I close, a few words about The Leatherneck’s director, Howard Higgin, who died too young at age 47. In spite of his brief career Higgin was an important filmmaker during the transition years at the end of the silent era. He got his start working as a production manager in the late teens and early twenties for Cecil B. DeMille, shadowing the great director on his light comedies and dramas starring Gloria Swanson — a few also featured a young William Boyd. Higgin was directing by 1923, and would helm more than twenty films before his death in 1938 — he’d serve as screenwriter on another twenty more. If nothing else he was a Welles-ian trouper, employing the same actors over and over again. Boyd starred in five of his directorial efforts, including Clark Gable’s breakout film The Painted Desert, High Voltage with Carol Lombard (they too worked together often), and Skyscraper with Leatherneck cast member Alan Hale. Hale also worked with Higgin and Fred Kohler on the delightful and utterly unseen Sal of Singapore, which I look at in depth at Where Danger Lives. Higgin’s films did well at the box office, and were well thought of by critics and the academy. 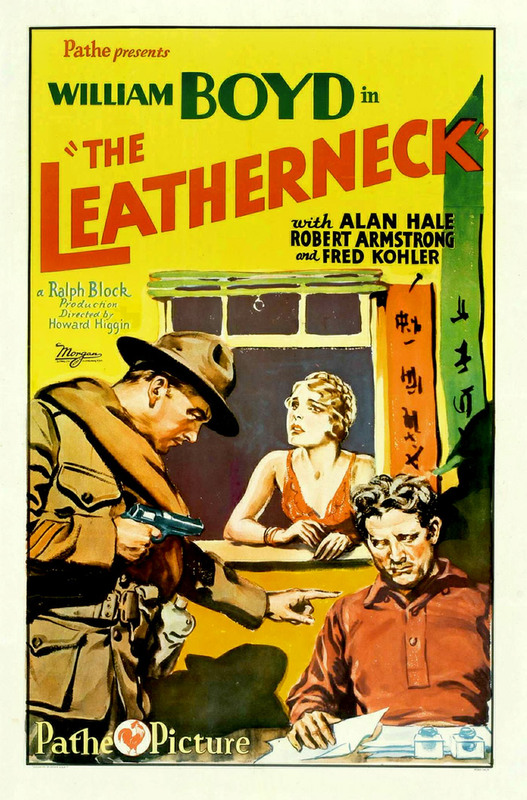 Three of his features (The Leatherneck, Sal of Singapore, and Skyscraper), each written by Elliot J. Clawson, were nominated in the 1930 Best Writing category. Clawson was also nominated for a fourth film in the same category that year, The Cop, which although not directed by Higgin, amazingly starred William Boyd, Alan Hale, and Robert Armstrong! Truly, Hollywood was a small town. Final note: Many of these films, including The Painted Desert, High Voltage, The Racketeer, and others are available to watch for free at the Internet Archive. Simply connect via IMDb. Where were you able to find a copy of this movie? If I remember correctly I purchased a bootleg from a private seller.